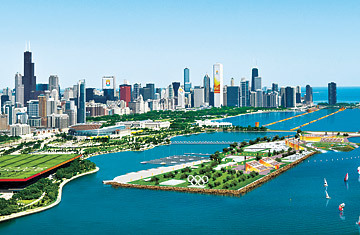 Would Getting the Olympics Be Good or Bad for Chicago? Chicago's plans would turn Lake Michigan into a sprawling sports complex. President Barack Obama has been doing his part to help Chicago win the 2016 Summer Olympics. He has taped messages of support for the International Olympic Committee (IOC) and hosted a reception at the White House to help raise his adopted hometown's profile. Now he's flying to Copenhagen to personally help Chicago with its final push. The IOC will make its decision on Oct. 2, after considering rival bids from Madrid, Tokyo and Rio de Janeiro (which is considered the front runner). But in light of the heavy financial burden that is associated with staging the Olympics, the question is: Would getting the Games really be a good thing for Chicago? For the Second City's business community, the answer is a resounding yes. "We view the opportunity as one of those pivotal moments in our history," says Lance Pressl, an executive at the Chicagoland Chamber of Commerce. "Innovative juices flow, our broad shoulders get flexed and collectively we transform this great city into something even better." But that hasn't always been true. The economic benefits of the Olympics for host cities are at best mixed, and the opening bravado often descends into recrimination and regret. Of course, there are obvious benefits for an Olympic host city  primarily the opportunity to showcase itself in front of a global TV audience numbering in the billions. Indeed, many view the Olympics as the ultimate infomercial to help attract business and foreign direct investment (FDI). But that has to be balanced with the danger of runaway costs, which seem almost guaranteed when it comes to the Olympics. Brad Humphreys, professor of the Economics of Gaming at the University of Alberta, keeps count on Olympic budgets. His tally is a tale of excess: Athens budgeted $1.6 billion for the 2004 Games but wound up spending $16 billion. Four years later, Beijing budgeted the same amount, $1.6 billion, for the 2008 Summer Games yet spent an enormous $40 billion. London originally planned to spend $8 billion for the 2012 Games; the current estimate is $19 billion and rising. "Once the Games leave town, there often isn't much to celebrate," says Humphreys, noting that host countries nearly always experience a drop in GDP growth in the year after the Games. In terms of sheer financial disaster, however, it would be hard to match Montreal's 1976 Games. It has taken the city more than 30 years to pay off its extravaganza, the cost of which is still not entirely known, according to Humphreys. The Olympic stadium was a particular disaster; originally budgeted for C$156 million, it ended up costing the city C$2 billion, including numerous fixes to the roof and years of interest payments. The Quebec government had to introduce a special tobacco tax to help pay down its Olympic investment. Vancouver, which will host the Winter Olympics in 2010, has already had its debt rating downgraded because its Olympic Village has turned into a money pit that could end up costing taxpayers as much as $1 billion. As for the total price tag for Vancouver's Games, estimates vary from $1.6 billion to $5.5 billion. One reason for the wide disparity is how the costs are allocated. In Vancouver's case, there's a big debate about how to account for two major projects being built for the Olympics: a light-rail link connecting the city to the airport, and costly upgrades to the Sea to Sky highway, which winds north along Pacific fjords. Should these projects be part of the Olympic budget or (because they will presumably serve the city for years afterward) part of the general municipal budget? Either way, the projects will take decades to pay down. If there is one Olympic city for Chicago to emulate, it would be Atlanta. The city's $1.7 billion privately funded Summer Games in 1996 sparked a construction boom in the city's downtown core and, according to the Metro Atlanta Chamber of Commerce, generated $5 billion in economic activity, including $1.8 billion in hotel, residential and commercial construction. What's more, the city found long-term uses for its Olympic venues, transferring the Olympic stadium and village to the Atlanta Braves and Georgia State University, respectively. "The Olympics gave Atlanta a tremendous boost in commerce," says Sam Williams, president of the Metro Atlanta Chamber. "We become a global city, not just the capital of the South." However, critics say Atlanta got too caught up in the idea of making the Olympics self-funding. As a result, it missed out on state and federal money that could have paid for upgrades to neighborhoods and sewage systems. Chicago estimates that the cost of hosting the 2016 Olympics will be $4.8 billion. If its bid finds favor with the IOC this week in Copenhagen, the city might be well advised to get venues shovel-ready as quickly as possible, for it has one advantage that Atlanta didn't: access to a portion of Washington's $787 billion economic stimulus package, much of which is still being allocated. If, on the other hand, Chicago doesn't make the cut, the city shouldn't feel too bad. For municipalities, the Olympics deliver more broken dreams than gold medals. See 10 things to do in Chicago.